Innovation is the name of Skamper Kampers' game when it comes to the Dingo Ultimate, and the judges were blown away with the improvements made to the Dingo, in light of comments made during judging in 2016. 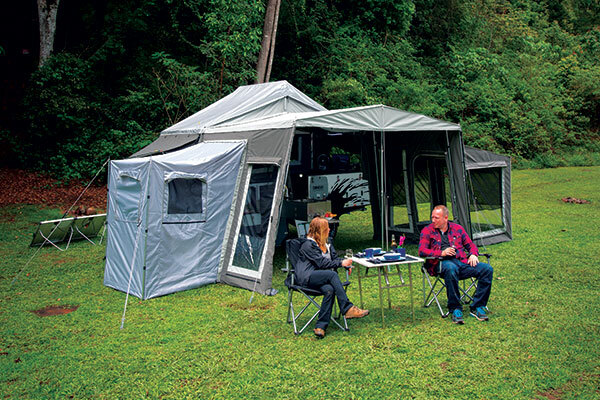 Self-sufficient, ready for rugged environments and equipped with plenty of creature comforts to make your next trip a pleasure, this is a forward fold that packs a punch in features and function. Forward fold designs have, from the beginning, had limitations. They were generally heavy, as are the ball weights, and they mostly suffered from poor storage. There was no access to the camper interior without fully opening the camper up. Urgently need a jacket or rain gear due to a weather change, and you’ll find yourself on the roadside folding the camper out because the gas strut is always across the entry door. Skamper Kampers took our comments after last year’s CTOTY and completely redesigned their Dingo. The weight is still up there, at 1680kg, and the ball weight at 160kg is not exciting, but considering this is a bigger camper than most forward folds that isn’t too bad. However, now you get a huge camper-wide slide-out drawer for all your clothing which can be opened from the outside (and inside). There’s a hinged end on the stone guard so you can access a gas bottle when the camper is set up. There's 12 storage areas (compared to the usual five or so), some of which are quite roomy, and the rear water tank is now internal so it doesn’t need to be protected. The pole storage has been moved to the rear and the axle forward for better balance. The kitchen is next to the pantry and fridge for efficiency and this makes the rest of the awning area more functional. The full size queen inner spring mattress, leatherette seats, instantaneous gas hot water with digital temperature control, roomy interior, pre-set internal tent bows and standard touring awning with just three poles, all make this something of a breakthrough in forward fold design. 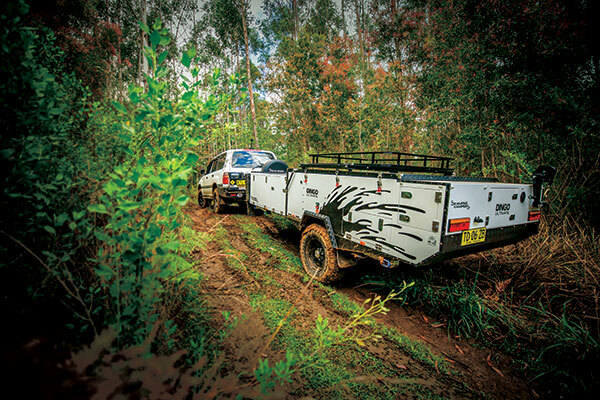 Like its canine namesake, the Dingo Ultimate is well equipped for time spent alone in the bush, far from civilisation. It has a big 140L stainless steel water tank, built into the body of the camper to prevent damage on the tracks. This water storage can be supplemented by two jerries, with inbuilt holders, for a total of 180L of water capacity. There are also two 4kg gas bottle holders, which are plumbed through to the stove and the instantaneous gas hot water service that feeds the kitchen and the shower – another must have when it comes to multi day off the grid adventures, at least in my book. Power comes from twin 100Ah AGM batteries with a full battery management system. There’s a CTEK DC-DC 10A charger and twin Anderson plugs for both vehicular and solar charging. There are USB and 12V sockets where you need them, and plenty of lighting, too. Small 240V gadgets are run from a 900W Victron inverter. Skamper Kampers say, “camping in our great country just got easier. The Dingo Ultimate by Skamper is a quick and easy to use forward fold hard floor camper trailer.” They’re right, and the Dingo Ultimate provides an ultimate camping environment. The crew at Skamper Kampers has been quick to move with the times. We’ve seen the Dingo previously and loved it, but the new Ultimate is a leader in forward fold technology. Skamper target a price sensitive range of campers with basic models right through to the Ultimate. The Dingo is the family tourer, a terrific traveller, an offroad warrior and a comfortable home base all in one. This is a rugged camper with some real points of difference. 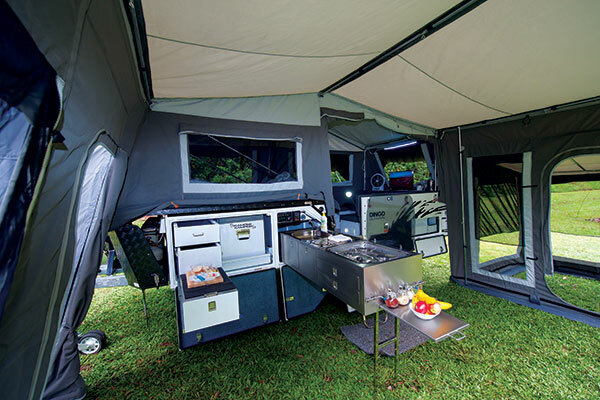 It's built on a strong galvanised chassis with ground clearance enhanced by the security of a 140L stainless steel water tank, fully enclosed within the deep camper body. It features a fully redefined kitchen, a terrific rear pole storage allowing extended internal area, full battery management system with inverter and built-in instantaneous hot water system. There's also a large pantry, more storage than we thought possible and a tent with a large footprint and plenty of sensible add ons. The Dingo Ultimate is tough and rugged, but also has a softer side with a host of creature comforts. There’s room for a large family with the Queen bed, convertible dinette and a separate kids room. That's not to mention shade, protection and even a large ensuite. It’s got the power, the weight, the skill and the comfort – what more could you ask at well under $30k? The Skamper Kampers Dingo Ultimate is hands down one of the biggest forward folds on the market. It’s an absolute beast in every direction and weighs in at an almost eye-watering 1680kg. You’d almost forgive Skamper if they wiped their hands and gave up any attempts at offroad-ability, but they’ve actually done the opposite. Starting from the bottom they’ve decked the Dingo Ultimate out with a one piece chassis. From the McHitch offroad couple right through to the LED tail lights the Dingo Ultimate rests on 100x50x4mm chassis rails. That means no step ups to get caught, and no pivot points as stress risers. 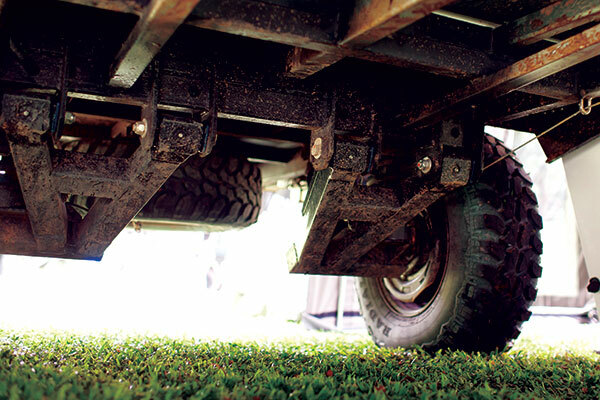 It runs Skampers' typical independent suspension arrangement, with Aussie springs and shocks on both sides. The whole affair has been hot-dip galvanised, with the underside of the body coated to protect against chips. 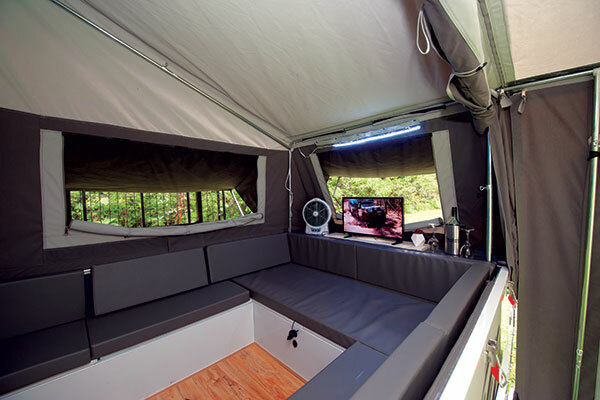 There’s been no timber used throughout any of the camper’s construction, and Skamper have gone to great lengths to ensure you can wail on it from sun up to sun down. There’s no external lines or hoses underneath, the water tank has been designed inside the body itself, and even the stabiliser legs have been mounted up high away from damage. Sure, it’s heavier than a midnight screening of Schindler’s List, but it’s built to be tough. You could almost wash it with a sand blaster and a sledge hammer. If you’ve got a tow tug with serious grunt and aren’t scared to bury your right foot, Skamper Kampers' Dingo Ultimate could be the tank you’ve been looking for.